It is believed that lung cancer is caused by smoking. But people who do not smoke can also get cancer. Lung cancer is a dangerous disease. Asbestos Fiber: This fiber is used on terrace of house or shops. It contains calcium that goes in lungs and creates lungs cancer. Factory: The factory workers of coal, arsenic or news paper printing have risk of lung cancer. Lung Fibrosis: Thos who has lung fibrosis problem, they have high risk of lung cancer. 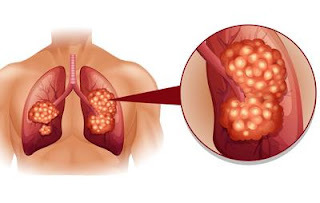 Chronic Bronchitis: Those who suffer with chronic bronchitis problem they might suffer lung cancer. Genetic: One might suffer with lung cancer if their parents have lung cancer.